Juissen2 is the new generation of extractors with cold-pressed materials TRITAN (100% free of BPA) and lower turnover, only 43 rpm. Compared with conventional blenders, Juissen can increase juice production by up to 65%. Juissen2 uses a revolutionary system of extraction of juice. Unlike other conventional methods, Juissen2 not squeezed or crushed, but press the ingredients by slowly rotating system. Thus, the juice retains a high percentage of the nutritional value of fruit, vegetables, vegetables, cereals, etc. maintaining its natural properties and 100% of its flavor. Slow Juice is the big difference Juissen2. 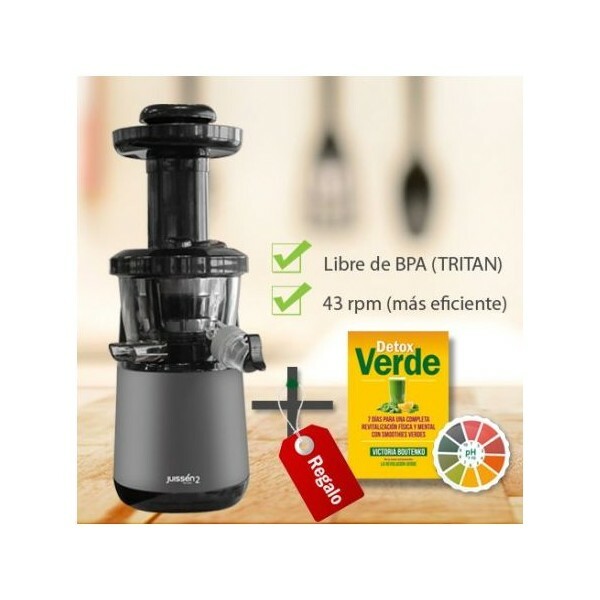 While conventional blenders cut fruit with blades by a rapid rotational movement which produces heat and thus, destruction of nutrients ingredients, Juissen2 runs at a speed and lower temperature, producing juices that do not oxidize as quickly and retain their properties for longer. Furthermore, compared to conventional blenders, Juissen can increase juice production by up to 65%. Made in TRITAN, a type of BPA free plastic very rugged and Bisphenol A. Slower rotation system: A lower speed than Juissen1 of 65-43 rpm, which makes more efficient! 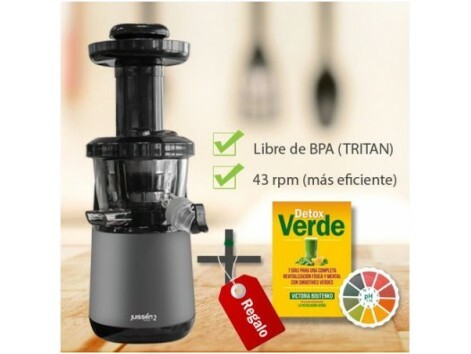 The slow rotation system preserves the main characteristics of the food and guarantees the best juices and flavor to your recipes. High ripping speed: High speed extraction ensures rapid filling of the jar and prevents oxidation of food thus preserving most vitamins. Silent: Thanks to its slow rotation, with Juissen not have to worry about annoying noises while producing their tasty recipes. Filters: the machine comes with two different types of strainers, one of larger and smaller. We give pH strips, so you can measure your level of acidity and alkalinity, and the last book of Victoria Boutenko, DETOX GREEN. Book collecting keys and teachings that the author has accumulated over 15 years of workshops and retreats green smoothies. With this work will have all the practical information you need to organize your own plan depurativo and thus enjoy its important therapeutic benefits. This guide provides detailed information to develop a comprehensive program of nutritional revitalization in 7 days.